Hi, I’m Sara Vaca, independent consultant (www.SaraVaca.com), AEA365 Outreach Coordinator and Creative Advisor, and contributor to Saturday’s posts. As a former program manager, evaluator and meta-evaluator, I have come across maaaany reports. And probably many less that you. Lesson Learned: Reports (inception reports, evaluation reports, program reports, you-name-it-reports) seem to continue to be one of the most common ways, almost like the unit we package information and knowledge to be shared. And even though there are alternative supports for it, it will probably be years (decades?) until we move on from them. Hot Tip: Since we continue producing reports for others to read, let’s strive to make them look more appealing than the average we are used to read. Including Data Visualization elements to complement and illuminate the text, and/or eventually using graphic design services to improve its looks can help us spice them up. But there are other underexplored alternatives. Cool Trick: Instead of opening a blank Word document to create your report, open a Powerpoint file to write it. What?! Yes, a Powerpoint document can be equally converted to a pdf, after which it will become a report, regardless of the program it was created in. A Powerpoint file, either in portrait or landscape orientation, can be a much better friend to facilitate your product looking much more innovative. 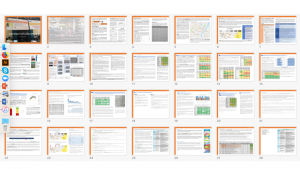 Advantages: Powerpoint allows me to think much more openly about the layout of the report. 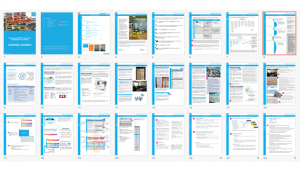 It is much easier to do different-width columns lay outs and alternating paragraphs and visuals in a very dynamic way. Besides, it allows you to customize each page in its all particular manner. I also find it makes you craft your sections in a more concise style, as you feel somehow limited in space (though in reality you can use as much space as in Word if you wish). Finally, the use of visuals, icons and tables is way less painful than in Word. Finally, I also use Powerpoint for other purposes, for example, I am doing the last versions of my visual CV in it. Thank you for sharing your ideas with the community. I also use PP/Google slides to track notes for regularly occurring meetings. I’d love to see the examples of your reports in the post. Is there a link?